Whether you are opening a new store for the first time or just another location, go all out for the first day of business. Promote it as much as possible through any and all sorts of media platforms, including radio spots. Utilize social media to get the word out and build anticipation to gain people’s interest. But don’t do all of this for nothing. Make sure your grand opening is truly grand by providing food, deals, and entertainment to make sure people are having fun but also to ensure they remember the day. Once they have left your store, the excitement can still continue. Collect the names, emails, and addresses of those who showed up to your grand opening so you can keep them informed in the future of deals and other events. That way they will want to come back for more. It is an easy way to begin a lasting, trusting bond. So your grand opening went off without a hitch and people are still talking about the good time they had. This is the perfect time to keep the foot traffic going! Capitalize on the buzz by planning future promotional events that build off of the good energy and increased awareness. Aim to have promotional events with some degree of regularity, such as one event per quarter, to keep the customer’s already piqued interest. Get creative with the planning and remember that it is pivotal to make your events unique and memorable (just like your grand opening was). When no two events are the same, people will have a much easier time remembering them and, in turn, talk about them. While larger scale promotions are great ways to generate buzz, they can quickly become a very expensive venture. One old-fashioned method that never lets anyone down is having sales. In-store only sales create exclusivity and are great ways of getting people to get out of the house and into your place. If you have been building up a database of past customer information (which you should be), it can be very easy to get the word out about your next big sale. While it might not be as exciting as throwing a huge opening party, the bottom line is sales work. Sure, you’ve probably heard it one million times before, but there are few truer statements in the world of retail than, “customer satisfaction is everything.” Without customers, you do not have a business. If you have been successfully drawing customers into your store, you have the opportunity to provide something that the online experience lacks: a relationship with the customer. Take full advantage of this opportunity and go all out with your customer service to make them feel like royalty. You can do this by making sure your employees know as much as possible about the products and always help customers with enthusiasm. Just make sure it’s genuine enthusiasm! Over-happiness is a thing. Still, when a customer is satisfied, they are more likely to spread positive word of mouth, which only helps get others to your store. While it may seem like the internet can sometimes be the enemy for a store owner, the truth is that you should embrace the technology. Because so many people use the internet, it helps bring customers into your stores. Having the right online marketing campaign can bring in more shoppers than a billboard. Plus, because so many online shoppers have received items that do not meet expectations, they would rather go in store to view the product themselves. Utilize the immense online universe to place targeting ads in front of customers that will be most interested in your products and watch your ROI increase exponentially. 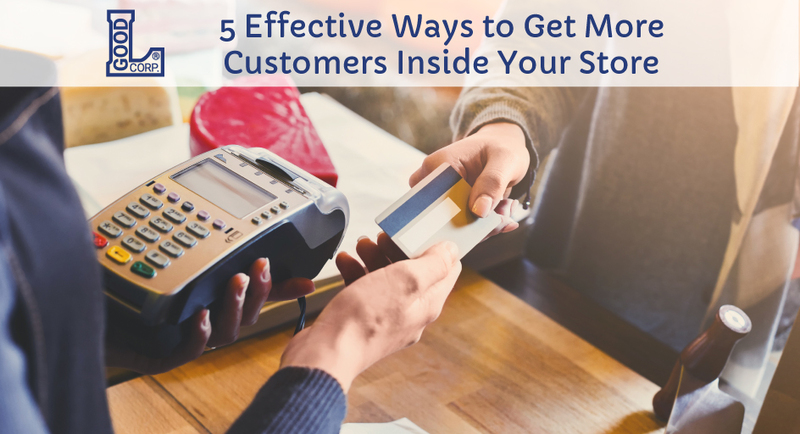 When you do have an influx of customers coming to your store after following these tips, make sure they have a place to put their items. If you are in need of durable shopping carts or baskets, give the Good L. Corporation a call and let us provide you with the right shopping cart solution.